I expect you have heard of River Cottage and Hugh Fernley-Whittingstall? Fabulous food, organic and Fairtrade ingredients, cookery schools and campaigning for ethically produced seasonal food. During River Cottage Spring (2008) Hugh helped a group of Bristol families start a smallholding on derelict council land. he experience was so inspiring he decided to see if it would work nationwide, and Landshare was created to bring keen growers and landowners together. The movement now includes more than 50,000 people. Well we were very pleased when they selected our top quality Fairtrade certified organic aprons for their staff. They really are beautifully made and they were sewn and dyed in a special colour just for River Cottage. Our aprons are made in India by a cop-operative and you would be hard pushed to find any other aprons as well made. Their construction is really “old fashioned” in the most beautiful way that we in the west don’t often see. That is probably why they were selected for River Cottage. You can see our Fairtrade and organic aprons here and out more about River Cottage here. Well the order for the Eden Project, aprons dyed with tea and coffee, have all been safely delivered. I am genuinely proud of them. The are of great quality, the weight of fabric and the construction and the colour……I love the strong but somehow, still soft colour. We decided to have some made to hold in stock for potential new customers. It is this type of judgement that we have to make – to hold stock or not? Do we take the risk of buying garments without having confirmed customers or do we wait for customers and then manufacture to order for them? I have made a few mistakes – and although I realise that this is the only way to learn – my mistakes are not my most favourite thing. 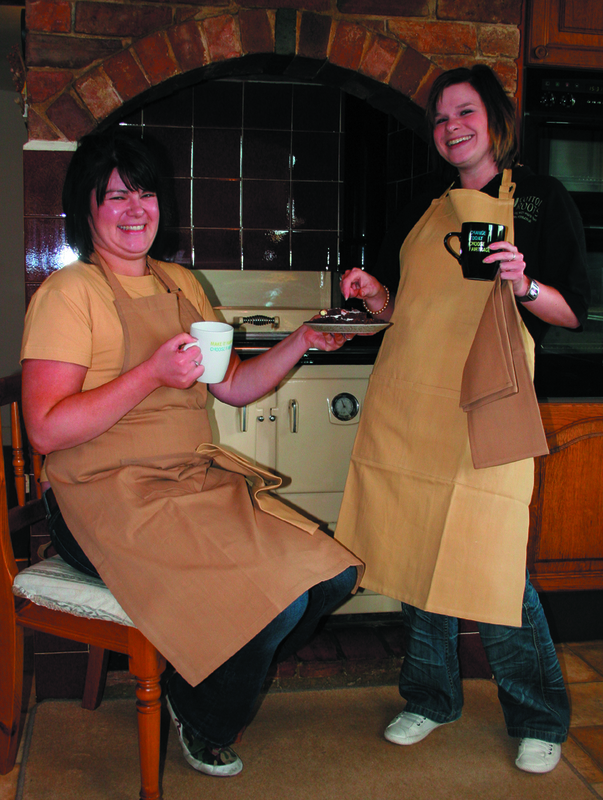 For example I have lots of organic bar aprons in both unbleached and black fabric, but I have found that we have had sold far more of our Fairtrade and organic bibbed aprons – the bar aprons wait patiently (but not me). Naturally dyed garments in our industry (company clothing, uniforms) are a step ahead. It will take us a while to find the customers who are committed and leaders themselves to take this route with us. We have had t shirt fabric manufactured and dyed so that we can show potential customers. Currently we have pomegranate, madder, coffee, tea plus swatches of a huge range of other colours we can supply using less familiar plants found in India. 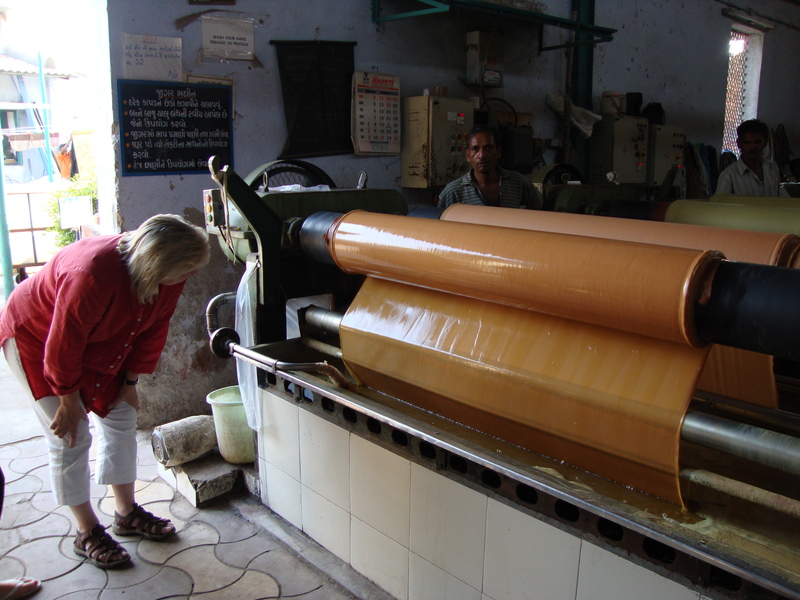 My favourite colour at the moment is the beautiful orange dye made with the skin of pomegranate. My current idea (as I am writing this) is to ask Jenny and Ros to come up with a print design for the front of naturally dyed T shirts. A design that gets across the message of “Dyeing for change”. We will then print it, or embroider it and see if we can find a committed organisation who would like to use it for their uniform or to sell in their shops to promote the idea of dyeing naturally. ……Well it’s Sunday and I am expecting a visitor so I have to stop thinking about business and start 1. to tidy the house 2. to think about preparing food (maybe a picnic). But before I go, if you are interested in “the perfect t shirt” take a look at http://www.betterthinking.co.uk/perfect/ I found this article sometime ago and found it useful and interesting. The grand open of the new, swish, really, really green, City Eco Hotel takes place on Friday 9th of April in Bournemouth. We have supplied the hotel with their catering staff aprons which are not only organic, made with fairtrade cotton, but also dyed organically using plants. 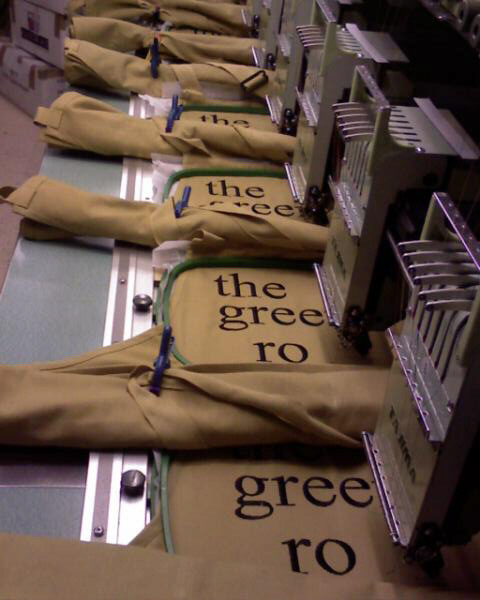 The shipment from India arrived today so we are burning the midnight oil to embroider the aprons with “The green room” or The green house” and make sure we deliver them on time. Burning the midnight oil is part of running a company and the enjoyment comes when customers are pleased with us and the garments. We opened the parcels excitedly – as this was the first batch of aprons that we have made especially for our customers – City Eco Hotel and the Eden Project. It was a nervous few days as the aprons were “Stuck in customs”. “Stuck in customs” is a phrase that always gives me the collywobbles. It could mean weeks waiting………. I was worried. But lots of phone calls later and helpful assistance and they were “unstuck” and arrived today. Hooray! The hotel staff will also be wearing Fairtrade polo shirts which are unbleached. This means that the colour is a beautiful oatmeal hue. We have embroidered the polo shirts with the hotel emblem, a leaf. They polo shirts are organic and very soft to touch – so of course scrummy to wear. I am excited and proud that the director of the hotel Sarah Burrows decided to use our uniforms. We are trying to expand Fairtrade and organic options for customers all the time. Their hotel motto is “Luxury doesn’t have to cost the earth”. I like it. So look out for the hotel if you stay in Bournemouth www.cityecohotel.com. 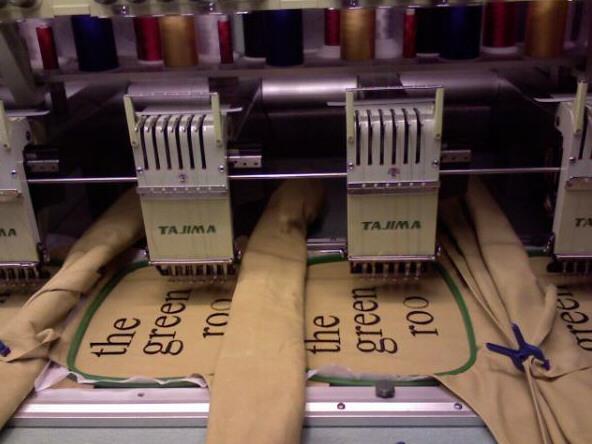 MUST get back work embroidering their aprons…….off I go.